The picturesque stroll down to Peppercombe is one which has a wonderful sense of mystery to it. Commencing from the pub at Horns Cross you meander down the steep pathway ,where you are enveloped by tranquil woodland. A sensation of peace and solitude enfolds, and the gentle trickling of the stream can be heard, accompanied by the melodic sound of the birds singing their song. Amidst this lush and green woodland, there is a diverse range of flowers and wildlife to be appreciated. Passing a small bridge and quaint thatched cottage, the path continues approximately a mile, before the woodland terminates and unexpectedly opens out onto a meadow. Venturing across the meadow you walk through a gate and down an unmade pathway, encased with a canopy of trees ,which leads you to the quiet and secluded beach of Peppercombe. 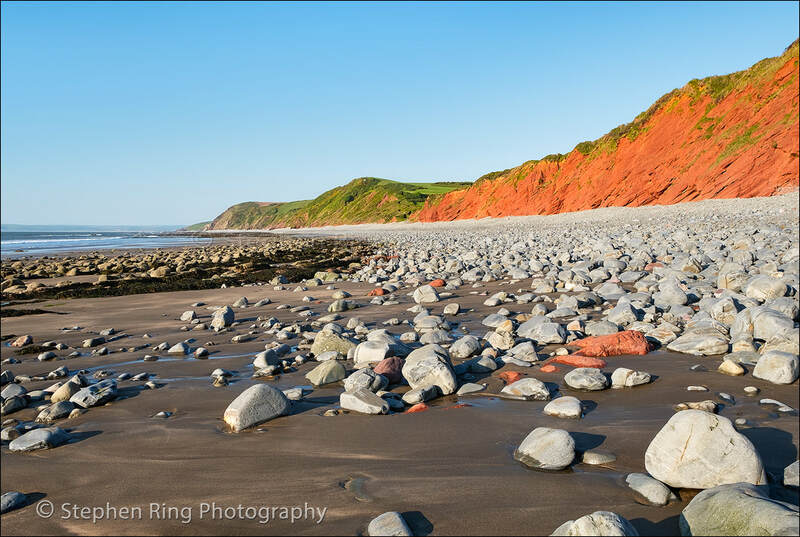 Encountering this sheltered rocky beach you are surrounded by impressive red cliffs ,which are prominent for miles around and the stream running through the woods concludes its journey as a small waterfall that cascades onto the beach. When the tide is out it reveals a sandy beach, and is interspersed with interesting rock pools ,and marine activity ,whilst fishing is good at low tide. This unique beach is a world away from the stresses and strains of modern society, and the solitude is overwhelming. Encompassing this isolated beach are high craggy cliff tops ,which provide inspirational panoramic views, and which are home to the South West Coastal Path. Walking this path will bring you to the remains of Peppercombe Castle, which was once an Iron age hill fort ,and was then succeeded by a Victorian Castle. Unfortunately little remains of this historical structure ,apart from a few stone fragments immersed amongst the vegetation, however the consistency of the dramatic scenery never alters. This exhilarating walk offers the diversity of woodlands, grassland and coastal scenery, all rolled into one. It gives the opportunity to explore and experience the beauty of nature, whilst generating the feelings of solitude and serenity. A feeling so rare and so precious but one not to be missed.